This segment is on Wikipedia. Founded: On October 29, 1999, the domain for Nupedia.com is registered. It's an encyclopedia with articles written by volunteers, which are then reviewed by expert editors, before being published. The company is incubated, and funded, by Bomis, a web portal focused on male-oriented content that was founded by Jimmy Wales in 1996. Initial company description: "Two years before Wikipedia, I had the dream, the vision, for a free encyclopedia written by volunteers in all the languages of the world. This inspiration came to me from watching the growth of free software, open sourced software, as most people know it. And watching programmers coming together and giving away their work for free online," Wales says later. "I realized that kind of collaboration could extend beyond just software, into all kinds of areas. The encyclopedia was sort of the low hanging fruit. It seemed quite easy." Personnel, at three months from founding: In January 2000, Wales hires Sanger to be the company's first employee. "In January 2000, I e-mailed Jimmy and several other Internet acquaintances to get feedback on an idea for what was to be, essentially, a blog. (It was to be a successor to "Sanger and Shannon's Review of Y2K News Reports," a Y2K news summary that I first wrote and then edited.) To my great surprise, Jimmy replied to my e-mail describing his idea of a free encyclopedia, and asking if I might be interested in leading the project," Sanger writes in 2005. "He was specifically interested in finding a philosopher to lead the project, he said. He made it a condition of my employment that I would finish my Ph.D. quickly (whereupon I would get a raise)--which I did, in June 2000. I am still grateful for the extra incentive. I thought he would be a great boss, and indeed he was." 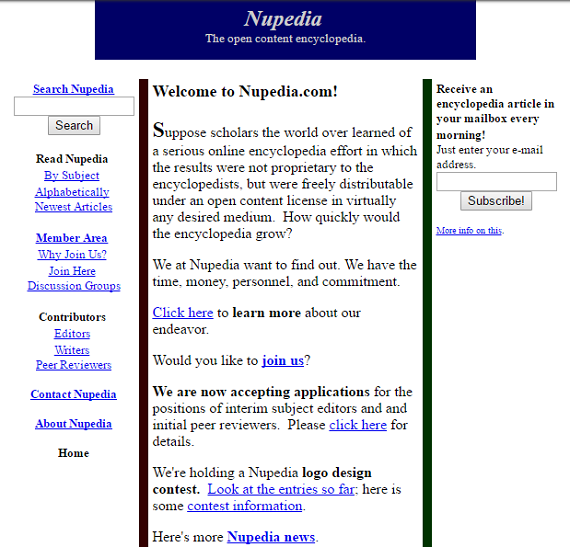 Launch, at five months from founding: Nupedia officially goes online on March 9, 2000. The first article, published that month, is written by a scholar at the Johannes Gutenberg University in Mainz, Germany, on the subject of atonality. Traction, at one year and three months from founding, 10 months from launch: Due to a lengthy editorial process, which includes a seven steps for articles to be published, Nupedia sees extremely slow growth, with only 12 articles published and another 150 in the pipeline. Product, at one year and three months from founding, 10 months from launch: As a result, Wales and Sanger look for a faster way to get articles published to the platform. In January 2001, Sanger advocates for the idea for using wiki technology. "A Nupedia wiki would instruct users to try to make their entries resemble encyclopedia articles, but the usual wiki sort of banter would be permitted. This would make things more interesting to many users, who could *instantly* create, edit, and comment on articles. If a wiki article got to a high level it could be put into the regular Nupedia editorial process," he writes. Sanger's idea is to use it a feature, and that articles would then become part of the Nupedia process.The Nupedia wiki goes online on January 10, 2001, however, due to concerns from the company's board about not wanting to associate with the wiki format, the project is named "Wikipedia" and given its own address, which is registered on January 13. Wikipedia.com officially launches on January 15, 2001. This date will eventually become known as Wikipedia Day. Traction, at one year and three months after founding, 10 months after launch: By the end of January, Wikipedia already has roughly 600 articles from 10 contributors. Expansion, at one year and five months after founding, two years after launch: The first subdomain for a non-English Wikipedia, the German version of the site, is created in March 2001. Advice solicited! Just write here on the homepage for a couple of days, and then we'll get started next week. I do not speak German. Larry Sanger speaks some. So only English speaking people (who also speak German) are likely to be able to effectively communicate with me." Traction, at two years and nine months after founding, two years and four months after launch: By July 2001, Wikipedia has 8,000 articles from 62 contributors. Press coverage, at two years and nine months after founding, two years and four months after launch: In August 2001, Wikipedia gets its first press mention in the Wales on Sunday newspaper, in an article called, "Knowledge at your fingertips." "Both Encarta and Britannica are official publications with well-deserved reputations. But there are other options, such as the homemade encyclopaedias. One is Wikipedia (www.wikipedia.com) which uses clever software to build an encyclopaedia from scratch. Wiki is software installed on a web server that allows anyone to edit any of the pages. At the Wikipedia, anyone can write about any subject they know about. The idea is that over time, enough experts will offer their knowledge for free and build up the world's ultimate hand-built database of knowledge. The disadvantage is that it's still an ongoing project. So far about 8,000 articles have been written and the editors are aiming for 100,000." Traction, at two years and 10 months after founding, two years and five months after launch: By September 2001, Nupedia has 12 articles published, while Wikipedia has over 13,000 from 128 contributors. Personnel change, at two years and three months after founding, one year and 10 months after launch: In February 2002, Sanger is laid off at Bomis following a clash with Wales over the use of nonexpert editors on Wikipedia. As a result, Sanger steps down as chief organizer of Wikipedia, though he continues to contribute to the site. Business model, at two years and three months after founding, one year and 10 months after launch: In February 2002, the Spanish language version of Wikipedia forks over fears that the site will introduce advertisements. In response, Sanger writes that the Wikipedia and Nupedia projects "are soon to be given to a nonprofit organization for management and stewardship." 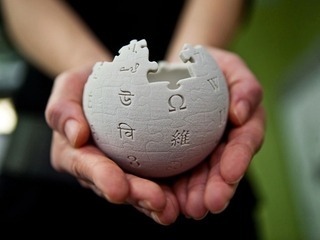 Product, at three years and two months after founding, three years and seven months after launch: on December 12, 2002, Wiktionary, Wikipedia's first sister project, is brought online. It's a project to create a free content online dictionary. Traction, at three years and three months after founding, two years and 10 months after launch: In January 2003, the English edition of Wikipedia reaches 100,000 articles from 503 contributors. More than 37,000 articles are now being worked on in the non-English editions of Wikipedia. Business model, at three years and nine months after founding, three years and four months after launch: On June 20, 2003, the Wikimedia Foundation is incorporated as a way to fund Wikipedia and its sister projects through non-profit means, rather than through advertising, though Bomis still owns Wikipedia and Nupedia for the time being. "For the time being, the two machines on which Wikipedia runs will be continue to be owned by Bomis, but my intention is to donate those if the tax implications make sense. I have to consult with an accountant on that, first," Wales writes in a blog post. "I do NOT encourage you to make donations to the Wikimedia Foundation just yet! I am still working on tax exempt status with the IRS, and I have not yet set up a bank account for the foundation anyway. Those things will take a couple more weeks." Product, at three years and 10 months after founding, two years and five months after launch: In September 2003, Nupedia is officially shut down. SInce launch, it has only 24 published articles and 74 others in the pipeline. Its text is incorporated into Wikipedia. There are now roughly 70,000 active contributors working on more than 41 million articles in 294 languages on Wikipedia. There are over 5.4 million articles on the English lanuage version.